A bridge suspended above a Chinese river by more than half a kilometre has now opened to the public – becoming the highest of its kind in the world. The Beipanjiang Bridge is raised 564 metres above the Beipan River in mountainous southwest China, making it the highest bridge ever built. Designed by a team of Chinese engineers, the bridge has a 1,341-metre span that carries four lanes of traffic over the Beipan River. It connects the provinces of Guizhou and Yunnan, and is expected to reduce journey time between the cities of Liupanshui and Xuianwei from five hours to just two. Before now the world's highest bridge was the Sidu River Bridge, also in China, positioned 500 metres above a river. 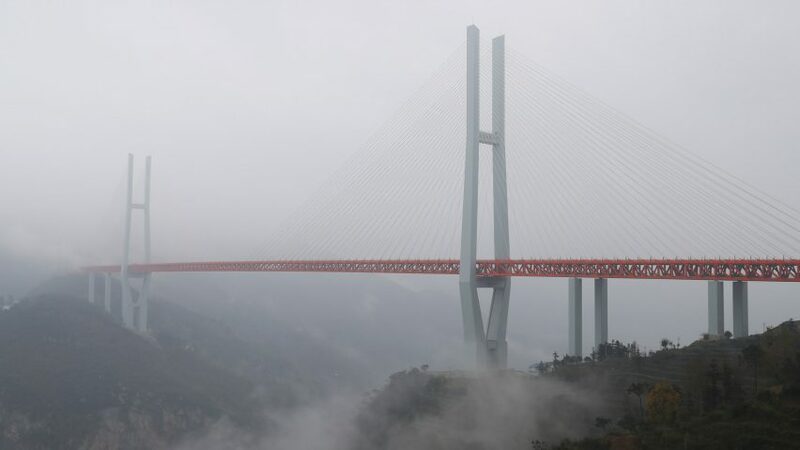 But the Beipanjiang Bridge is not the tallest bridge on the globe – that title still belongs to the Millau Viaduct by Foster + Partners, which is 245 metres, but with a deck raised up from the ground by only 270 metres. China is also home to several other record-breaking bridges. The world's tallest and longest glass bridge opened in the country earlier this year, while the world's longest sea bridge completed there in 2011. Other examples of impressive bridges in China include the undulating red Lucky Knot Bridge, completed by NEXT Architects in October this year.